Anyway, I do other stuff at work too, including dabbling in predictive models. I can’t produce weekly picks for you, but one of the things I can do is discuss some point-in-time power rankings. Most of the models I’ve looked at become active after week 5, including the latest iteration of my own. For fun, I’ll post the initial rankings here for most of the European leagues as they come online, and you guys can argue about them until your heart is content or filled with hatred. Either way. A quick note on methodology: These rankings know nothing about the league table. They don’t care what team is in first and what team is in last, and operate on an entirely separate statistical methodology. They have a large n of data across multiple seasons of testing behind them and are predictive of future league places in the table, but variance exists. Relegation: Waalwijk. Utrecht and Roda both in danger. Welcome to the craziest league in Europe. A league where the teams who were at the top have basically eschewed winning any matches for the last three weeks or so. A league where 3-3 is somehow a normal scoreline. How weird is this league right now? The team with the best goal differential is in 5th. The team with the third best goal dif is in 8th. The only other major league where the GD leader isn’t in the top two right now is England, and it’s bloody strange there too. Also, more than half the teams in the league have a positive goal differential. It’s a lot of fun to follow the stories and read the writing of people like Michiel Jongsma, Nikos Overheul, and Peter McVitie who are covering the league. Ajax has made a fairly significant bounce since I last wrote about this league. Gone are Christian Eriksen and Toby Alderweireld, and they suffered a bit in their absence. However, the team now seems to be performing at a better level. They still have issues defensively versus expectation, but are shaping more and more like a team that could turn into challengers by the end of the season. That said, the model still only ranks them 5th. 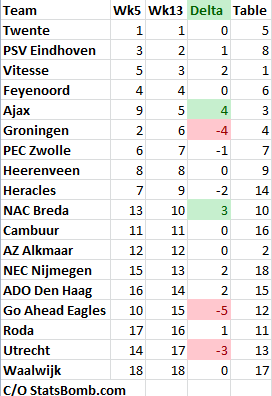 On the slide are Groningen (still good, but always unlikely to maintain that level of performance), Go Ahead Eagles (creeping toward the danger zone), and Utrecht, who the model views as definite relegation candidates. Utrecht and Waalwijk look like the two worst defensive teams in the league across all the advanced metrics, and they don’t do enough offensively to make up for it. Nijmegen aren’t nearly as bad statistically as their current league position. I called Waalwijk to be relegated weeks ago. Nothing has changed there. Groningen has fallen off, but Twente and PSV are still at the top and look like the only real contenders for the league title. Vitesse is also playing well enough that if one of them somehow stumbles, they will likely be the team that takes their place. Look, I know that the two teams the model likes the most are in 5th and 8th place right now, but a total of 6 points separate 1st from 10th! If Twente and PSV continue to just do their thing, they’ll probably be at the top of the table come game 34. League Winner: Dortmund or Munich. That’s it. CL Spots: Leverkusen, Wolfsburg. Hamburg are too far back. Gladbach likely to fall away. Relegation: Freiburg. Braunschweig, Nurnberg. Bremen, Augsburg, and Frankfurt could still be in the mix. Wow is Bundesliga volatile. Most leagues sort themselves out quickly and you see only a couple of major movers in the next 5-6 weeks. Not in Germany. The biggest plunge of any team in Europe was made by Augsburg. I mentioned last time that their position in the league rankings was a surprise, but their plummet has been equally surprising. The model suggests their combined issues on offense and defense are costing them about an extra half goal a match, when their baseline stats suggest they should be much, much better. My guess is that this is down to errors and inferior personnel, but I haven’t watched nearly enough of them to know better. Schalke have also fallen steeply in the model rankings. They are still 6th in the league table with a goal difference of 0 and a Shot Dominance under 1. Good luck with that. This team is basically the most confusing one in Europe in terms of where the model places them versus where they are in the league table. On September 23, they named Bert Van Maarwijk, manager of the 2010 World Cup Final with the Netherlands, as their new manager. Since BVM took over, they have gone from mid table in the model to top 3. Except they sit 14th in the table. Goal difference suggests the model is definitely seeing something that hasn’t shown up in the league table yet, but 3rd best team in Germany? Really? I am sceptical… and it’s MY MODEL! Welcome to my world (and yes, your own scepticism is duly noted). I will say there is a lot of younger talent on that team. I feel like if van Maarwijk gets their defense sorted out, they will make a strong push up the table in the next 20 matches or so. Freiburg are definitely getting relegated. 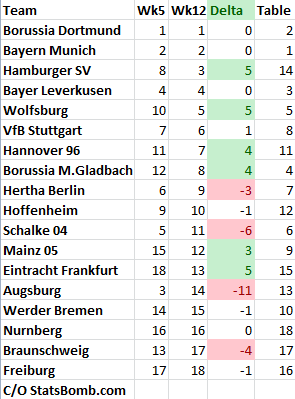 Nurnberg changed managers and are creeping up, so might have a chance to escape – they are basically dead level in model coefficient with Braunschweig now. There are other teams that could potentially get sucked into the vortex listed above, but these three are the most likely to finish in the bottom 3. I’m not going to tell the master how to do things, but Klopp kinda maybe might need to rotate his kids a bit more. Despite the two tough losses last week, they are still one of the two best teams in Europe. League Winner: If Roma get + stay healthy, then Roma or Juve. If not… Juve. CL Spots: Roma, Inter, Napoli, Lazio, Fiorentina. Inter to Fio is a tight cluster of teams all about the same strength. Relegation Candidates: Catania. Sampdoria. One of Parma, Atalanta, and sigh, Verona. 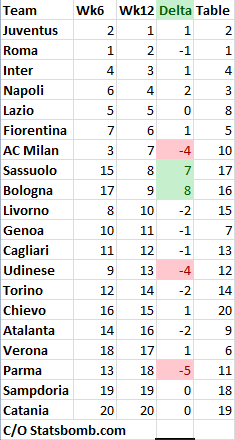 The two biggest positive movers are Sassuolo and Bologna, whose points total is near the bottom of the league, but who the model thinks should actually finish much closer to midtable. Personally I have no opinion about these two – I’m just reporting what the math says. Napoli also improved slightly, but their coefficient isn’t close to the two elite teams in the league. I generally liked their summer purchasing, but Albiol sticks out like a sore thumb. On the downslope are AC Milan (injuries and a seemingly inevitable backlash against Allegri), Udinese, and Parma. Parma are now clustered with a group of teams that could potentially get relegated. Their shot dominance isn’t that bad, but they play in a way that leaves them very little margin for error if they ever fall behind. Catania are simply not good, and the table reflects this. Don’t expect them to move off the relegation range without some crazy luck. Sampdoria look like they should be better, but they are wasteful offensively and seem strapped for talent on both sides of the ball. Verona likely are not getting relegated, but they ain’t finishing 4th either. The last relegation spot in SerieA isn’t remotely clear. Okay, so Juve have some issues at the back this season, much more so than in the past. They’ve just had moments of poor concentration leading to defensive errors, and Buffon Is God has turned into Buffon is Human. He’s 36 this season – these things happen. That said, Juve are again ridiculous. Their midfield 3 of Pirlo, Vidal, and Pogba is the best in the land and probably one of the best in the world. Llorente and Tevez have certainly improved an attack that didn’t really impress last season, and their coefficient has rocketed upward over the last six matches. Roma’s has fallen off a bit, which is expected when you lose the best player in the league this season (Totti) and Gervinho at the same time. They should still make the CL pretty easily, but they need both of those guys healthy and quickly to keep up with the Turin juggernauts. Compare the model positions of Verona and Atlanta to the table positions of those two teams. Italy gives zero fucks about our silly math.